People often ask how to get the "feeder" cards which allow you to evolve protagonist cards to purple (see the full list of feeder cards here). 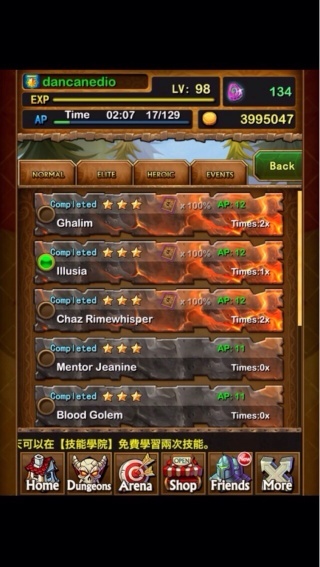 If you look at any of the Elite dungeons from Temple onwards you will notice that most missions cost 11 AP while a few cost 12 AP. The latter are the so-called "12 AP Elites". The 12 AP Elites all have a small chance of dropping their whole card every time you beat them. More importantly though, every 200th 12 AP Elite that you defeat is GUARANTEED to drop its whole card. The game will even warn you when you have reached your 200th 12 AP Elite and a whole card is about to drop. 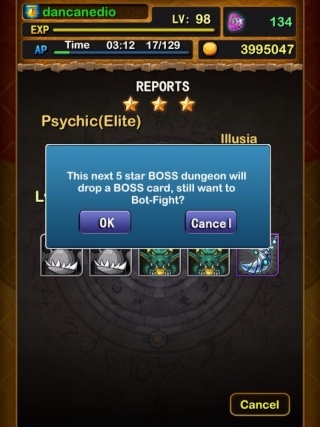 How it warns you depends on whether you are using the Auto-bot to fight your Elite dungeons for you or whether you are fighting them manually. If you kill as many 12 AP Elites as you can every day this will help to bring your next guaranteed 200th drop around as quickly as possible. That's what most people do. Farming the 12 AP Elites probably is the best way to obtain these feeder cards. However, it's not the only way. You can farm Normal dungeons for the feeder cards and very, very, very, very, very rarely a whole card can drop. Normally though you will receive a puzzle piece of the boss card roughly once every ten runs or so and, typically, you need 80 such pieces to create a whole card using "Synthesize" from the game's main menu screen. Note that there are no guaranteed drops in Normal dungeons. You can farm Heroic dungeons for these cards too and whole cards can drop, rarely and randomly. If a whole card doesn't drop you will receive a puzzle piece of the boss card or an item of equipment instead. Note that there are no guaranteed drops in Heroic dungeons either.